FOR many years Bill Mitchell was one of Sydney’s leading trainers with 11 Gr.1 winners to his credit. Since leaving the training ranks he has, for some seven years, been the racing manager for the Segenhoe Group while continuing to successfully act as an agent and consultant for a valued group of clients. 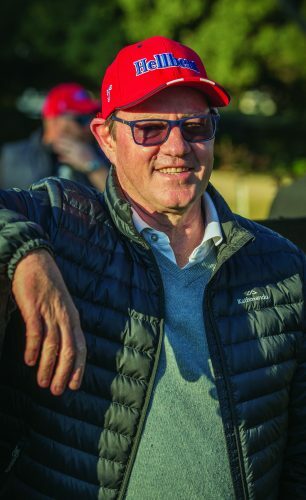 Combine the Hong Kong success of recent purchase Beat the Clock with the ever-evolving sale and racetrack success at Segenhoe and it’s clear Mitchell remains a leader in his craft. Q: The Mitchell family is well known through Yarraman Park Stud but where did the connection with horses begin? A: “Our father had a farm at Narborough in Norfolk, England, just north of Thetford, where His Highness Sheikh Hamdan now has his Nunnery Stud. As many British farmers did, Dad also dabbled with thoroughbreds on the property, both flat horses and jumpers. Q: Swapping East Anglia for the warmth and relative seclusion of the Hunter Valley must have been a shock to a young man heading into his teens? Q: Yarraman was a working stud farm when your family took over, what were the next steps? Q: So, did you see training as a natural progression once you left school? on the Berkshire Downs. Although I’d been around horses all my life, either riding or working on the stud farm, I wouldn’t say I was interested in training horses up until that point. Q: With that second winter approaching did you return home? A: “I did, I came back and worked for Neville Begg for nine months. Then I was off again, this time to California to work for Neil Drysdale for a couple of years when he was a private trainer. Although his base was at Santa Anita we spent the summers in Saratoga and a lot of time travelling horses around the country. Q: Was there a particular win as a trainer that sticks in your mind? Q: It’s been well documented you trained horses of the calibre of Dignity Dancer (Zabeel) to win a Spring Champion Stakes and an Australian Guineas and Stylish Century (Double Century) to a Spring Champion, a Victoria Derby and almost a Cox Plate, so with that level of continued success what prompted the retirement from training? A: “It was 2005 and I’d pretty much just had enough. I found the private consultancy work far more appealing, so I developed that into a business. Then in 2011 Kevin Maloney of Segenhoe was on the lookout for a racing manager and Michael Sissian filled in the dots, introducing me to him. From there I was offered the role, which I jumped at, starting in the May of that year. Q: And what did that entail? A: Besides looking after Segenhoe’s racing stock my brief when I started was to build the broodmare band, looking for acquisitions off the track both here and overseas. In the years after the Global Financial Crisis the then stud manager Royston Murphy and I were able to build a solid band, buying from a market that was fairly flat. A significant number of those purchases have since proven they were good value and continue to do well. Waiting to find out if your broodmares are any good is a long road but we are seeing the results now as the daughters of those high-class mares we purchased are starting to win stakes races. “Custard (Lonhro) and Girl Hussler (Hussonet) are good examples of what we’ve achieved, they weren’t expensive and have really performed. Custard has come up with three stakes performers in a row; Serene Majesty (Fastnet Rock) won at Gr.3 level in Melbourne, Curdled (All Too Hard) won a stakes race at two in Brisbane and in between she has a nice Hinchinbrook mare called Brulee, who also picked up black-type in Brisbane as a juvenile. Girl Hussler has dropped Taking Aim (Choisir), who won the Ken Russell Memorial Classic at two and has the very handy Witherspoon (Exceed and Excel) who isn’t a stakes winner yet, but I’m confident she will be. Q: So, has there been a broodmare purchase that has stood out for you? A: “Sister Madly (Redoute’s Choice) was a beauty. As a half-sister to Hong Kong Champion Silent Witness (El Moxie) we did have to go to the even $1m to buy her at auction, but she repaid us winning $400,000 on the track in her next four starts, including wins in the How Now Stakes-Gr.3 and Salinger-Gr.2, and then her first foal by Sepoy made $1.2m at auction. Commercially she has been a terrific mare for us. Q: I see Sister Madly isn’t in foal this year, what plans do you have for her? Q: Along with your role at Segenhoe you’ve been credited with plenty of success in a private consultancy and advisory capacity, is that something you will continue in future? A: “Most definitely, there’s a certain excitement of getting it right for a client. Going back, I bought and trained Snippets’ Lass (Snippets) for Francois Naude and as the dam of Snitzel and Hinchinbrook she has certainly left her mark. I’ve also had some success for Kenneth and Merrick Chung with horses like Speedy Natalie (Al Maher), who won the Adrian Knox Stakes-Gr.3 and her first foal Sweet and Speedy (Street Cry) won The Vanity-Gr.3 at Flemington. Q: What advice would have for someone looking to start out in the industry?